These are a few of the companies I have worked with recently. Bruce Burlington & Co. Ltd. I was approached by Virtual BM to see if I could help them overcome the problems they were experiencing monitoring sales by manual means, the use of Microsoft Word for example and manual e-mailing. After chatting to Amanda at Virtual BM I proposed two solutions, one office based using Microsoft Access, the other, Intranet based which has the added advantage of being usable while away from the office, all the data is held in one place therefore there are no synchronisation issues. The system has been developed to run in an HTA, thereby providing a clean browser interface in which to present the data. Multi access levels, users are only offered relevant options. Auto presentation of overdue data with one click client e-mailing. Useful reporting facilities with clearly formatted client reports. 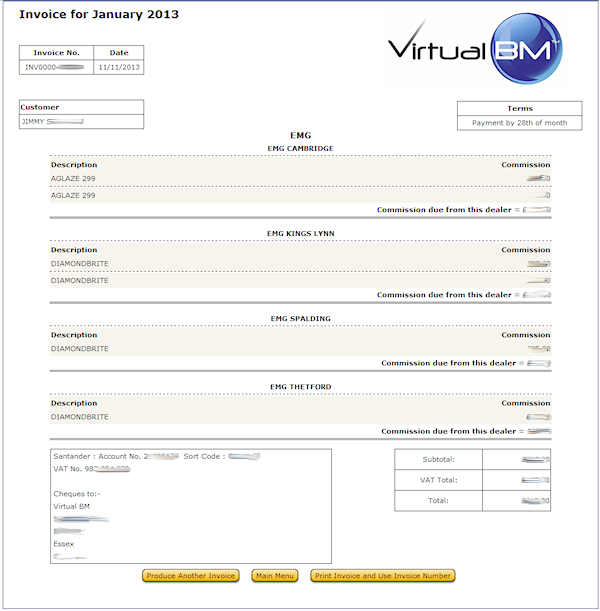 Update: After using the original system for some time, Virtual BM contacted me to discuss the possibility of adding some basic invoicing facilities to the system, at that time the client used reports from this system to create invoices in another system, so it made sense to create invoices directly from this system. 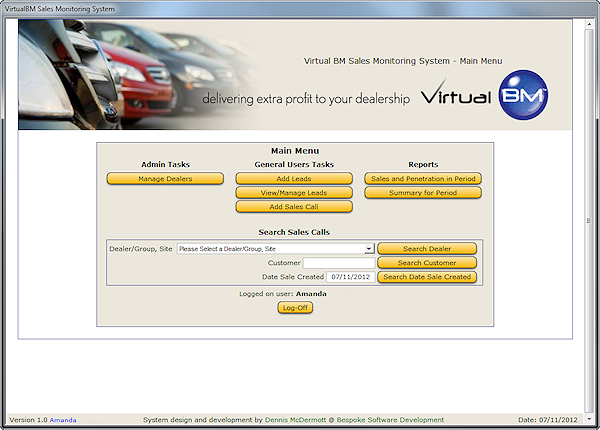 This was achieved by creating a report with user selected selection criteria to select either individual dealers or dealer groups for invoicing, upon production of each invoice the system increments the invoice number ready for the next invoice, thereby ensuring a consistant numbering facility. It also required adding facilities to store contact details for each dealer and provide facilities to maintain this contact data. Dennis has recently designed, developed and installed a bespoke sales monitoring and reporting system for my company, and I honestly cannot believe how easy the transition was! I was extremely impressed with the manner in which Dennis was able to take on board details of the specific requirements of our business and develop a system that is fast, effective and above all simple to use. In fact, after many years of working in various motor dealerships, and often having to use clumsy and overly complicated systems, this new system that Dennis has created for us is a refreshing change. My staff, who initially were slightly anxious about adapting to a new system, have taken to it in no time, and have been happily using it ever since! Throughout the complete development process from initial information gathering, through to system design and implementation, to user training and fine tuning, Dennis has been proficient, highly professional and incredibly patient, having the ability to be able to communicate clearly with clients who are not from a technical background, whilst simultaneously showing a depth of understanding about the business they are involved in and their specific needs. I would not hesitate to recommend Dennis and am looking forward to working with him again in the future.